The purpose of this PR is to add a Browse-By page for date fields as well as adding a Starts-With component to all Browse-By pages. Currently, the only date field using this component is "dc.date.issued" a.k.a. "dateissued". The route to this page can be found at [base-url]/browse/dateissued. This is a generic component extending from BrowseByMetadataPage and can be re-used for other date fields in the future. Two new components have been added: StartsWithText and StartsWithDate, both extending from an abstract component StartsWithAbstract. These components come with a decorator starts-with-decorator.ts to switch components depending on their "StartsWithType", currently being either Text or Date. This decorator is then used in browse-by.component.ts to switch to the correct StartsWith component depending on the type provided. The StartsWith component adds a startsWith parameter to the url to limit your search on the Browse-By pages. The issue should be fixed now. I simply forgot to change the "sort" property in the check to "scope". Nice catch! startwith parameter should be reset after, for instance, you choose a subject, otherwise you will have different announced results and returned results. I can imagine the increasing of phone calls to our support center regarding this issue. You will only see 4 records but financial therapy has 8. This is because the parameter "startsWith=F" is assumed and it's used along with the filter subject. I think the parameter shouldn't be set on this request. The startsWith parameter is not included in the links anymore when navigating browse entries. Please also consider the support for the month as in JSPUI (http://demo.dspace.org/jspui/browse?type=dateissued&sort_by=2&order=ASC&rpp=20&etal=-1&year=2019&month=1&starts_with=). Added a dropdown to support adding a month to the startsWith parameter. Thank you for considering my suggestions! This PR is fine by me. @Atmire-Kristof : I gave this a quick review this morning. The code is looking good, and thanks for all the TypeDocs/comments in your code! I found one interface where I'd appreciate TypeDocs being added. I haven't had a chance to test this out, but will do so later today. @Atmire-Kristof and @artlowel : I've tested this today. While the StartsWith & Browse By Date functionality seems to work fine overall, I've got some concerns/questions about the design approach here. First, I've noticed that with the addition of the StartsWith components, all of the Browse By pages no longer return a count of total results. I'm used to seeing the "Now showing items _ of _" and that is no longer displayed. Because the "Now showing" is missing, the behavior of the StartsWith components is very odd initially, until you understand what it is doing. It actually took me a moment to realize that saying "StartsWithDate = 2011" means I'll jump to seeing everything that has an Issue Date >= 2011. I think that's the correct behavior, however it's not at all clear to the user what is going on (i.e. this is likely a usability issue, and I think the "Now showing" (or similar text) would help, as it'd be clear you jumped to a new "page"). Browse by Author / Subject behave differently from Browse by Title / Date. The former seem to be acting as a filter (e.g. if you enter "S" in Browse By Author or Subject, you only see Authors/Subjects starting with "S"). The latter jumps you to a page in the list (so if you enter "S" in Browse by Title, you see Titles that start with S, T, U, V, etc). This may actually be an issue with the underlying REST API (or Solr index) -- I don't recall offhand. When using the startsWith param, the rest api will return the exact same pagination info for any item that would be on the same page if startsWith wasn't used. So if normally the first Title starting with 'S' would be the fourth item on the 15th page, then the pagination object the rest api returns when you ask for startsWith=S will contain number: 15, but no indication of the offset that item has within the page. So we don't have, and can't calculate the "now showing" info. This is also the reason why we can't show the more extended pagination control, because all we have to go on are the previous and next hal links. @artlowel : thanks for the clarifications here. I agree that it sounds like the third point is current behavior (so I'll withdraw that). I definitely understand that this PR isn't at fault for that change in behavior. But, I wonder if we can log this as a known bug and figure out a way to fix this in the REST API (and a future Angular UI PR) -- perhaps you could brainstorm with @benbosman on this? If we feel it's nearly impossible (or very hard) to retain that "Now showing..." text, then I feel we need some other sort of contextual information (in the UI) that helps the user figure out what this component is doing. Currently, as I noted, the behaviour was even confusing to me (a DSpace expert). 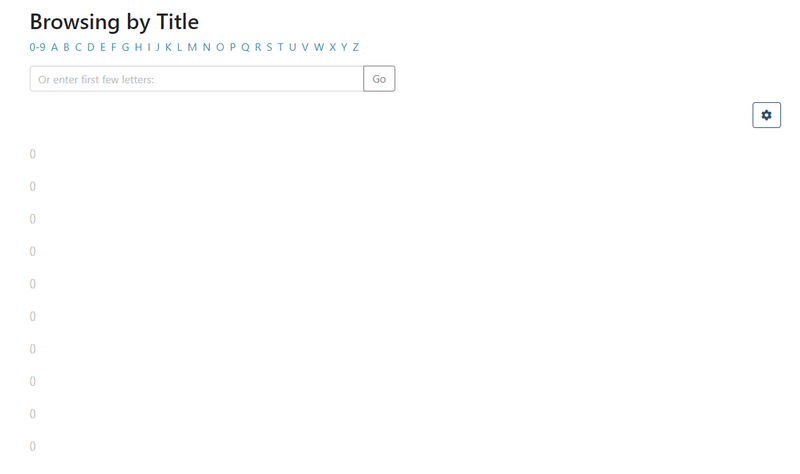 For example, in testing this PR, I went to Browse by Title and clicked on letter "F". As I had no titles starting with the letter "F", the first title I saw began with "H". I initially thought it wasn't working correctly, until I realized that what was going on. However, realizing what was going on was difficult, cause there was no way to page backwards. I literally had to clear out my search and double check if I had any titles starting with "F". So, I'm worried this UI currently has some significant usability issues (again, not really a fault of this PR alone). So, in summary, I'm OK with accepting this PR as-is (since it seems to "work") if we can develop a plan to improve it in the future. I'd like that plan to be documented (as best we can) in tickets. We could also discuss it further in next week's meeting (as a discussion topic) if necessary. @Atmire-Kristof and @artlowel : After today's meeting we decided to move ahead with this PR as-is, and I'll log a bug about this behavior. I'm guessing that some recent code on master must now be conflicting with this PR. Both Browse by Title & Author seem to work fine on master. 👍 Retested, and this works now. Merging. I'll be opening several issue tickets linking back to behavioral issues mentioned above.